As author, director and set designer, Jean Paul Gaultier takes a look at our times in both an extravagant and tender way, and invites us behind the scenes into his world fi lled with excess, poetry and magic. From his childhood to his early career, from his greatest fashion shows to the wild nights in Le Palace or London, Jean Paul Gaultier shares his journal of the times and pays tribute to those who have inspired him in fi lm (Pedro Almodovar, Luc Besson), music (Madonna, Kylie Minogue, Mylène Farmer) and dance (Régine Chopinot, Angelin Prejlocaj). In this show, thought out like a grand party, Jean Paul Gaultier will surprise us yet again. For this occasion, he designed tens of new exclusive outfi ts to incorporate within an exuberant scenography – without forgetting to invite his most iconic creations! To carry through with this project, he collaborated with the best in their fi eld, such as actress, scriptwriter and director Tonie Marshall, who co-directs the show, and Marion Motin (Madonna, Christine and the Queens, Stromae, RESISTE, the musical…) for choreography. 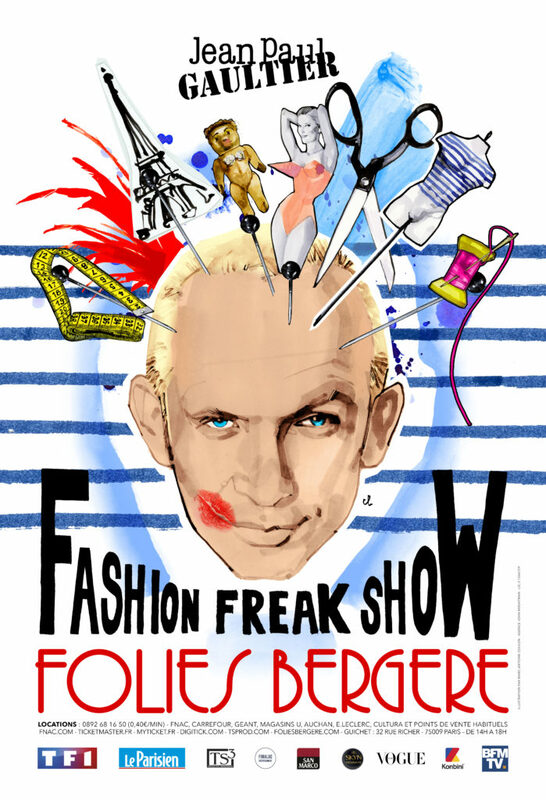 From disco to funk, from pop to rock and also new wave and punk, the Fashion Freak Show is an explosive playlist of hits that have inspired the artist throughout his life.